NEW YORK, Nov. 23, 2010 /PRNewswire/ — amNewYork, Manhattan’s most distributed daily newspaper innovates again, becoming the first U.S. newspaper to present its readers with an augmented reality feature that will breathe life into its Thanksgiving eve paper. Watch the Macy’s Thanksgiving Day balloons float from the pages of the paper, check out who’s invading Gotham and get answers to the day’s KenKen puzzle instantly. Through the use of junaio, the world’s most advanced augmented reality browser created by metaio, the leader in AR technology, amNewYork further bridges the gap between print and digital. On Wednesday November 24th, amNewYork will use the cutting-edge technology to animate parts of the paper with 3D experiences that literally will bring images to life on a few pages of the edition. Augmented reality integrates graphic overlays, or 3D models, into the real world through smartphones. To experience this new feature, users download the free junaio application from either the iTunes store or Android Market and select the “amNewYork” channel, scan the images, which will be identified on amNewYork’s pages, activate the animations and enjoy. 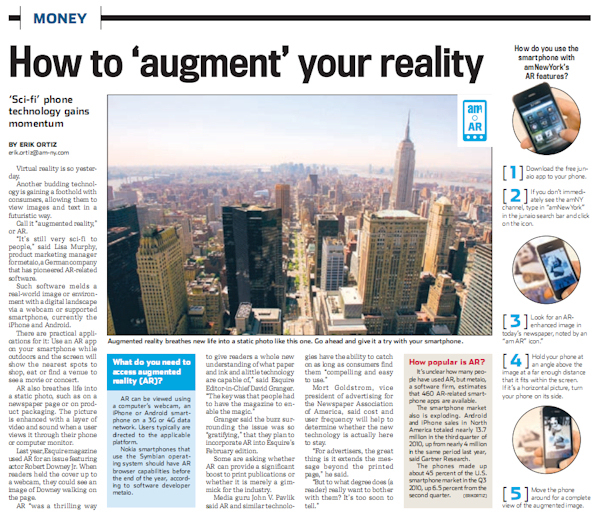 In the rapidly changing digital arena, augmented reality represents another leap unique to amNewYork that will further enhance its readers’ experience. Launched in 2003, amNewYork is Manhattan’s largest free daily paper, providing some of the worlds most diverse, discerning, and active readers quality journalism that is fresh, edgy and relevant. amNewYork provides NYC commuters with the most comprehensive free news, culture, trends and lifestyle coverage of the city, nation and the world in a convenient way. amNewYork is a Newsday LLC and Cablevision company. For more information about amNewYork, visit amny.com.